The Hot Dog Truck: Cash Money Contest Result! 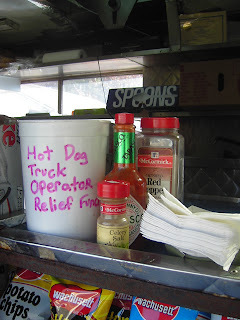 A while ago I published and announced my CASH MONEY CONTEST where folks could guess the dollar amount of the Hot Dog Truck Operator's Relief Fund and win half of the money in the bucket! 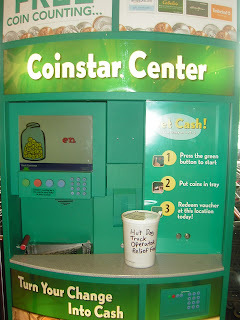 The contest ended May 31, so I took the Hot Dog Truck Operator's Relief Fund bucket to the Coinstar Machine today. And the total was $97.49. The closest guess was $142.88 by Mr. Livewyre of Munny for Hunny. Unfortunately, his guess was over the total so he DOES NOT WIN. He guessed a tad high, this time. Since I raised my prices a few months ago, I get more "folding money" in the bucket than change. I remove all folding money every day. I used to get more change in the bucket when my prices weren't round dollar amounts. C'est la vie! I am going to make this a monthly contest from now on. The PRIZE FOR THIS CONTEST will be ONE HALF of what is contained in the "Hot Dog Truck Operator's Relief Fund" as of the end of each month! You will need to guess the total amount of cash in the bucket without going over. Whoever is closest to the total amount without going over (can you tell I've watched the Price is Right) will win the cash! (I will actually send a money order but "cash" sounds so much better...) The "Fund" is pictured below. Hopefully the other objects in the picture will give you an idea of the size of the container. FYI it holds 5 pounds of Tuna Salad. You must announce my contest on your blog in a post and you must link both the contest post page with the phrase "CASH MONEY CONTEST" and the main page of my blog with the phrase "BEST HOT DOGS." Then email me at hotdogman@thehotdogtruck.com with the link to your post, AND your guess for the total amount in the "Fund" without going over. 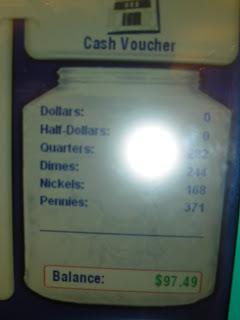 At the end of each month, I'll pop by the Coinstar machine, cash in the bucket and see who won. I will announce the winner on the Blog and contact the winner via email to arrange sending a money order. Just send me the folding money you take out.